Compelling evidence indicates that Shigella species, the etiologic agents of bacillary dysentery, as well as enteroinvasive Escherichia coli, are derived from multiple origins of Escherichia coli and form a single pathovar. To further understand the genome diversity and virulence evolution of Shigella, comparative genomic hybridization microarray analysis was employed to compare the gene content of E. coli K-12 with those of 43 Shigella strains from all lineages. For the 43 strains subjected to CGH microarray analyses, the common backbone of the Shigella genome was estimated to contain more than 1,900 open reading frames (ORFs), with a mean number of 726 undetectable ORFs. The mosaic distribution of absent regions indicated that insertions and/or deletions have led to the highly diversified genomes of pathogenic strains. These results support the hypothesis that by gain and loss of functions, Shigella species became successful human pathogens through convergent evolution from diverse genomic backgrounds. Moreover, we also found many specific differences between different lineages, providing a window into understanding bacterial speciation and taxonomic relationships. Gram-negative, facultative anaerobes of the genus Shigella, the principal etiologic agents of bacillary dysentery, continue to pose a threat to public health, with an estimated annual incidence of 164.7 million and 1.1 million deaths worldwide . They are sub-grouped into four species: Shigella dysenteriae, Shigella flexneri, Shigella boydii and Shigella sonnei. However, classification based upon serotype and other physiological properties has provided limited information regarding the genetic relationship between the species and, moreover, is not sufficient for making disease associations. The results of multilocus enzyme electrophoresis and multilocus sequence typing (MLST) argue that Shigella diverged from Escherichia coli in eight independent events and, therefore, may not constitute a separate genus [2, 3]. However, these results can't reflect the influence of horizontal gene transfer and gene loss. And comparison of genomic differences between different flora and strains will be helpful in revealing gene acquisition and gene loss in bacteria genome evolution, and in revealing the genetic basis of the diversity of biological activities . What remains particularly intriguing about Shigella, are the unique epidemiological and pathological features that each of the species exhibits. For example, Shigella dysenteriae serotype 1 can cause fatal epidemics in Africa; however, Shigella boydii is restricted to the Indian sub-continent, whereas Shigella flexneri and Shigella sonnei are prevalent in developing and developed countries . Development of a vaccine remains a significant task. Comparative genome information will assist achieving this goal as well as enhance our understanding of the pathogenesis of Shigella. Reports on the genome of the two S. flexneri 2a strains previously revealed a dynamic nature and unique characteristics when compared to the genomes of close relatives, the non-pathogenic K-12 strain and enterohemorrhagic O157:H7 strain of E. coli [5, 6]. Furthermore, we also have completed a project, which involved sequencing strains of S. dysenteriae Sd197 serotype 1, S. boydii Sb227 serotype 4 and S. sonnei Ss046, all epidemic isolates from the 1950s in China . The release of five Shigella sequences has initiated a new era of comparative genomics in Shigella biology. However, sequencing remains a laborious and expensive technique, making it difficult to obtain answers concerning the genetic composition of serotypes, or newly emerged variants of interest in a timely manner. The technique of microarray-based comparative genomic hybridization (CGH) provides a valuable adjunct to current protocols used for the assessment of differences and changes in bacterial genetic content. Indeed, this approach has already been utilized in a variety of bacteria to probe for differences between clinical isolates, vaccine strains, species diversity, and disease endemicity [8–11]. There is currently data on five Shigella genomes, which can reflect four lineage gene contents of Shigella. Such diversified genomic compositions stated previously [5–7] have prompted us to investigate gene distributions among all lineages of Shigella using a CGH microarray approach. Herein, we present the results of a genomic comparison of 43 Shigella strains based on CGH analysis, which maximizes and extends the information gained from genome sequencing efforts to closely related strains. And this sequence information will provide a valuable resource from which we can begin to dissect shared and distinct features of Shigella between different lineages and start exploring how and why these differences arose. In addition, the pattern of acquisitions and deletions detected on the DNA arrays may, to some extent, reflect the gene contents of eight lineages and the evolution of a strain's genome. Results for the four sequenced Shigella strains' hybridization were directly compared to expected hybridization results as assessed by the percent identity of each MG1655 and Shigella amplicon to the four sequenced Shigella genome sequences. From this analysis, we were able to determine that genes with ≥ 75% identity to the amplicon could be detected as present/conserved on our array, whereas genes that diverged by more than 74% could be assigned as absent/divergent (For details, see Methods). It is noted that positive signals in the CGH analysis may not indicate the presence of functional genes or a pathway. For example, although fec genes are present in Sd197, Ss046 and a few other strains, only Ss046 possesses an intact set. Generally, the results of the CGH demonstrated that the genome contents of Shigella spp. isolates differ markedly from that of E. coli strain MG1655. The number of ORFs, which comprised the backbone sequence of Shigella spp. strains used in this study, was 1955 (include 12 ORFs which were not present in MG1655), which was less than the number cited in previous reports [10, 12]. These conserved ORFs included all 231 essential protein-encoding genes listed in the PEC database except 19 ORFs not spotted on the microarrays . 2,245 ORFs of MG1655 were found to be absent in at least one strain (see Additional file 1). These ORFs accounted for 52.5% and 53.6% of all MG1655 ORFs annotated and spotted on the slides, respectively. The numbers of absent ORFs ranged from 476 in B5 to 956 in B3 (Table 1). The mean number of absent genes was 726, which is consistent with data from a previous study . There were 137 MG1655 specific ORFs absent in all strains. Among which 64 ORFs were absent in pathogenic E. coli too . The mosaic distribution of the absent regions and some gene clusters is shown in Figure 1A. Genes for cell motility, cell envelope, and carbohydrate transport and metabolism genes in the MG1655 genome (Table 2) were frequently found missing in the Shigella spp. strains (P < 0.001 based on the two-tailed Student t-test). For example, among the 43 strains of Shigella in our study, 35 showed a loss of several flagellar genes to different extents, while the other 8 strains had almost complete flagellar gene sequences. Moreover, E. coli surface pili have about 15 gene clusters, among which only 3 (hofCB-ppdD, ppdC-ygdB-ppdBA, and hofQ-yrfABCD) are found in most Shigella strains, which is in accordance with previous results . 399 identified ORFs of MG1655 have been annotated with regulatory functions in the PEC database . Out of the 2,245 missing ORFs, 167 are regulatory genes, the majority of which are regulatory transcription factors, including a few global regulatory factors. This result is consistent with the findings from the previous study [10, 15]. In addition, ompT, encoding outer-membrane protease, was found lost in all the strains, and cadA, encoding lysine decarboxylase, was not found in most strains, either. * NKU, NanKai University, Tianjin, China; CCDC, Chinese Center for Disease Control and prevention, Beijing, China; NICPBP, National Institute of the Control of Pharmaceutical and Biological Products, Beijing, China. # Altogether, 2,245 ORFs were absent in at least one strain, and 137 ORFs were commonly absent in 43 strains. * C1 contains D strains (D3, D4, D5, D6, D7, D9, D11, D12, and D13) and B strains (B1, B2, B3, B4, B6, B8, B10, B14, and B18) with F6 as minorities. C2 is mainly composed of B strains (B5, B7, B9, B11, B15, B16, B17) and D2. C3 consists mostly of F strains (F1a, F1b, F2a, F2b, F3, F4a, F4b, F5, Fx, Fy) and B12. Shigella strains are labelled according to the designations in Table 1. #The % indicated in parenthesis is relative to MG1655 total ORFs. Genome composition analysis. Each row corresponds to a specific spot on the array, whereas columns represent strains analyzed and are labelled according to the designations in Table 1. The ORFs status is color-coded: blue, present/conserved; yellow, absent/divergent. (A) The E. coli dataset. (B) The Shigella ORFs which were not present in MG1655. The region of the Shigella ORFs which were not present in MG1655 was enlarged. Ten prophage regions in the MG1655 genome and several selected gene clusters are indicated. SHI-1 and SHI-2 are Shigella pathogenicity islands. Sci island is the possible pathogenicity island that has been found in genome Sf301. The pdu gene cluster is correlated with propanediol utilization. Strains are labelled according to the designations in Table 1. In general, what we found was that the gene contents of most categories are more variable in C1 strains than those in others. For instance, 49.4% and 40.3% genes coding for carbohydrate and amino acid transport proteins and signal transduction proteins respectively, were absent from at least one strain of C1. In contrast, strains from C2 shared relatively more core genes of most categories than those from the other two groups (Table 2). However, it should be noted that the three Shigella groups consist of different number of strains which may also be a key influence to the count of conserved genes here. The alterations were observed scattered over the entire E. coli MG1655 chromosome. However, the prophages of strain MG1655 represent chromosomal variation "hot spots." At least 10 prophages and phage like regions were identified in MG1655 [16, 17], but few were intact among Shigella spp. strains. E. coli is able to utilize several types of carbohydrates. However, Shigella has lost the capability to use some carbohydrates due to the loss of several transport and conjugated genes, which are also the basis for the biochemical typing of Shigella spp. strains. CGH Result indicated that the missing genes were different in different strains. By means of CGH analysis, it was found that the lac operon is only intact in B9 and B15, while lacA and lacY are absent in all other strains. This result conforms to the observation that Shigella cannot ferment lactose. Moreover, the metabolism of mannitol, melitose and glycerol are also in accordance with the CGH results, however, results from galactitol and rhamnose show discordance with the CGH data. The reason for this discrepancy requires further investigation. Furthermore, the fact that Shigella is unable to use xylose differs from the CGH result with S. flexneri, and may be explained to a certain extent by a terminating mutation found occurring in xylA, the gene encoding D-xylose isomerase . The CGH results for genes related to transport and metabolism of some carbohydrates are shown in additional file 2. There were 886 Shigella ORFs that were not present in MG1655 (non-pathogenic Escherichia coli strain) on the microarray (see Figure 1B and Additional file 3 for the details). Since part of them were also present in some pathogenic Escherichia coli strains, those ORFs may be putative virulence-associated genes. Shiga toxin was only found in D1. Previously identified Shigella pathogenicity islands SHI-1 and SHI-2 are absent in Sd197 but present in other sequenced strains (SHI-3 from S. boydii is essentially identical as SHI-2) [5–7]. SHI-1 encodes an enterotoxin ShET1 and proteases SigA and Pic, all implicated in virulence  and SHI-2 (SHI-3) encode an aerobactin system for iron acquisition [19, 20]. Variants of the SHI-1 and SHI-2 (SHI-3) that were missing one or more marker regions were found in most Shigella strains. The sigA gene was conserved in most strains, while the pic gene was absent. SHI-2 is almost complete in S. flexneri while lost in D1 and D7. The iuc and iutA genes that encode siderophore and its receptor in the SHI-2 (SHI-3) island are present in all of the other strains. 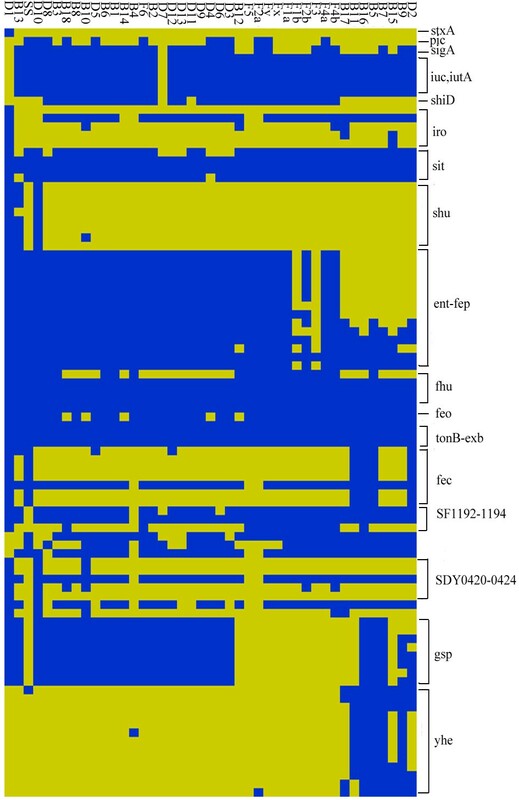 Sci island, the possible pathogenicity island that has been found in genome Sf301 , almost exist in all S. flexneri strains except F6, but are all missing in the other strains. And the pdu gene cluster, which is correlated with propanediol utilization, only exists in SS. The result of complete Shigella islands is showed in Figure 1B, while the result of selected virulence genes is showed in Figure 2. The distribution of the known and putativevirulence related genes among Shigella spp. strains. The ORFs status is color-coded: blue, present/conserved; yellow, absent/divergent. The designations of these genes are indicated on the right. Strains are labelled according to the designations in Table 1. The product of stxA is shiga toxin. SigA and Pic are serine proteases. The gene clusters of iuc, iutA, iro, sit, shu, ent-fep, fhu, feo, tonB-exb, fec and SF1192-1194 are all iron acquisition associated. Two type II secretion systems are encoded by yhe and gsp respectively. The products of SDY0420-0424 are exoproteins. Compared with E. coli k-12, most Shigella strains are missing fec, but have retained feo, fep, and fhu, and have even developed their own iron transport system (sit, iuc, iro and shu etc.). The type II secretion system (T2SS) encoded by genes of the general secretion pathway is widely distributed in Gram-negative bacteria . The well-known E. coli T2SS, encoded by the yhe genes at 74.5 min of the MG1655 chromosome, is absent in all sequenced Shigella genomes but present in several tested strains. Moreover, there is a novel set of gsp genes in the Sd197 and Sb227 chromosomes, which is also present in all C1 strains (see below for details) and several other strains (Figure 2). Using the above CGH microarray data and the previously published data , we performed phylogenic analysis (Figure 3). The phylogenic tree shows that most of the Shigella strains can be grouped into three clusters (C1, C2 and C3) leaving SS, D1, D8, D10 and B13 as additional minor branches. SS is closer than D8, D1, D10 and B13 to the main clusters. C1 contains D strains (D3, D4, D5, D6, D7, D9, D11, D12, and D13) and B strains (B1, B2, B3, B4, B6, B8, B10, B14, and B18) with F6 as minorities. C2 is mainly composed of B strains (B5, B7, B9, B11, B15, B16, B17) and D2. C3 consists mostly of F strains (F1a, F1b, F2a, F2b, F3, F4a, F4b, F5, Fx, and Fy) and B12. The results are in good agreement with the MLST result , supporting the hypothesis that Shigella species originated from multiple E. coli strains with diverse genetic backgrounds. Furthermore, two sonnei strains are grouped with three EIEC strains, and other pathogenic E. coli strains are grouped together. The high bootstrap values of most branches confirm the robustness of the tree. 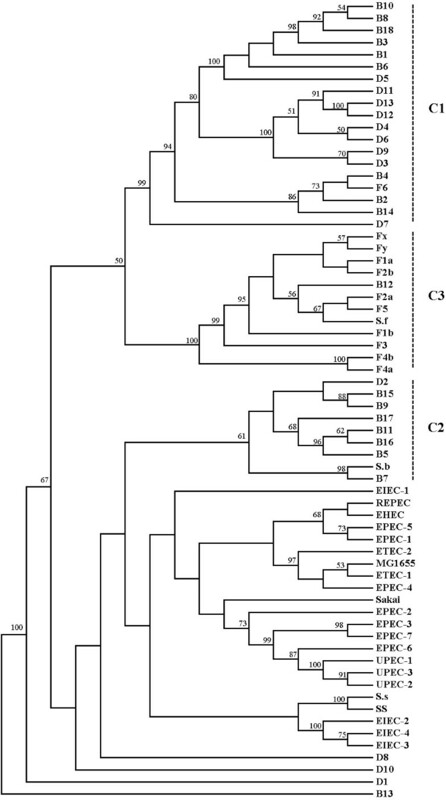 Phylogenic analysis of Shigella strains. Data were compiled from this study, and . Details on tree generation are described in Materials and Methods. Phylogenetic tree generated by the neighbor-joining method for the combined data of 66 strains (Table 1 and additional file 5). For Shigella strains used in our study, S. dysenteriae, S. flexneri, S. boydii and S. sonnei are abbreviated to D, F, B, and SS respectively, followed by the serotype number. E. coli k-12 MG1655 is abbreviated to MG1655. For pathogenic E. coli and Shigella strains used in previous study, the strains' abbreviations are according to the additional file 5. Bootstrap values greater than 50% are indicated at the nodes. The three major clusters of Shigella were indicated by vertical dashed lines in the right. In addition to what was discussed above, we also found many specific differences between different lineages, providing a window into understanding bacterial speciation and taxonomic relationships (Additional file 1). 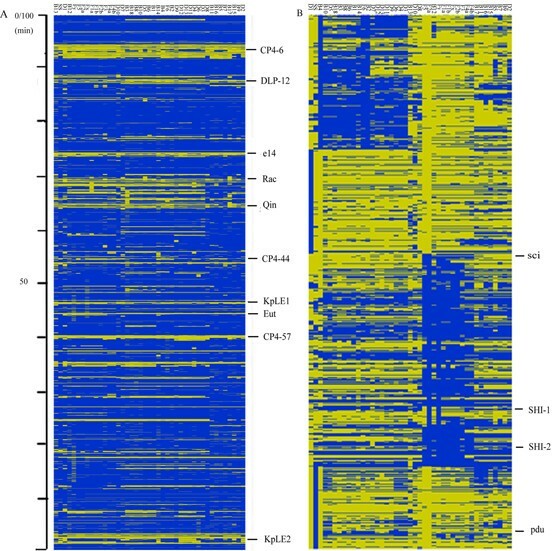 For example, ybcZ/ylcA, which encodes a two-component signal transduction system that is responsive to copper ions, is absent in three lineages (D1, D8 and cluster 1 strains), and the locus glc, which is associated with the glycolate utilization trait in E. coli, is only present in cluster 3 strains (except B12), several cluster 2 strains and B13. The locus aga, which is related to acetylgalactosamine metabolism, is only conservative in cluster 2, B13 and D10. F6 sits in a different cluster as compared to the other flexneri strains and we found many differences that set it apart (Additional file 4). For example, gsp genes, yea genes, waaWYJI, rhsABC and several phage-related genes were present in F6 and absent in other S. flexneri strains, while the cai-fix gene cluster, ybcZ-ylcA-ylcB, marAB, yehABCDE, glc genes, dgoTAK, bglBFG, yih genes, malGFE and safABC were absent in F6 but present in other members of S. flexneri. Abundant information is currently available for research on the genome evolutions of different organisms and the exploration of the roles played by different genes in their life processes. However, more and more evidence has revealed that most bacteria have shown unexpected diversity during the evolutionary process, even within one species . In order to systematically assess the genetic variability of bacteria, several genome comparison techniques, e.g., multilocus enzyme electrophoresis, MLST, pulsed-field gel electrophoresis and restriction fragment length polymorphisms, have been used. Microarray-based CGH has emerged as a revolutionary platform for comparative genomics that has recently been used for the analysis of genome variability among bacterial species or closely related bacteria. Given that the sequencing of strains on a large scale is time-consuming, laborious and unfeasible at present, CGH may resolve the problem to some extent by applying the available genome sequence information to closely related species. And this method can supply more information about genome composition and provide opportunity to analysis unsequenced strain on genomic scale. CGH proved a useful tool in this study for identifying genetic differences between different Shigella lineages over other techniques. Even though this technique has several limitations as described before , we believe, based on the criteria for data analysis, which we described before, that the use of CGH technology allows sufficient assessment of the genetic diversity and gene content among Shigella spp. strains. An MLST study  and five reported Shigella genomes [5–7] have suggested strongly that Shigella is derived from multiple origins of E. coli. And the five Shigella genomes vary in size from 4.3 to 4.8 Mb. Our study has revealed extensive diversity among Shigella genomes, forming a genetic basis to explain species/strain specific epidemiological and pathological features. The phylogenic analysis results supporting the hypothesis that Shigella have emerged from multiple independent origins. The fact that two sonnei strains are grouped with three EIEC strains supports the hypothesis that EIEC strains are in an intermediate stage and are a potential precursor of "full-blown" Shigella strains . Based on our results, we believe that the reason why Shigella exhibits unique epidemiological and pathological features is due to the loss of several genes and gene acquisition as described above. We found many specific differences between different lineages that never been described before. Previous study showed that there was over-representation of regulatory genes in the missing ORFs in Shigella/EIEC strains . Our result reconfirmed this observation. How these genomic differences account for the differences in epidemiology and pathology remain to be elucidated. A comparison with respect to the new group relationship is particularly significant in providing insight into the virulence of Shigella, such as F6, D8, D10, B13, etc. Furthermore, F6, which is distinct from other flexneri strains in several ways, should not be considered a flexneri member. And our results support the Brenner's suggestion to transfer F6 to the Boydii subgroup . Currently, there are data on five Shigella genomes, which can reflect only four lineage gene contents of Shigella. Our CGH results may, to some extent, reflect the entire genome diversity within Shigella and the evolution of a strain's genome. In addition, we found a large number of deletions in different genes of the relevant operon in carbohydrate utilization, emphasizing strong evidence for the extinction of these metabolic pathways. After Shigella became pathogenic to humans, the host presented a constant environment rich in metabolic intermediates, some genes were rendered useless by adoption of a strictly pathogenic life-style. These superfluous sequences were eliminated through mutational bias favouring deletions, a process apparently universal in bacterial lineages . The findings that diverse mechanisms appear to be responsible for same biochemical characteristics reconfirm the convergent evolution that Shigella might have experienced. For example, Shigella strains cannot decompose lactose, but each has resulted from a different mechanism. Some strains lost the lac operon completely, while others only lost lacA and lacY. The reasons to no flagellum and no motility of Shigella are also diverse. Understanding the virulence of Shigella, in addition to the CGH data, facilitates our understanding of the scenario that underlies the difference between these organisms. The pattern of acquisitions and deletions detected, may explain these differences to some extent. On loss and gain functions, it is important to recognize these differences may enhance the virulence or lead to variation in virulence. Variants of SHI-1 that were missing one or more marker regions were found in most Shigella strains. The SHI-2 island is only absent in strains D1 and D7, indicating its importance to most of the strains, and the unique iron acquisition mechanisms in the two D strains. Furthermore, our results indicate that SHI-1 and SHI-2 are genetic elements that have disseminated throughout Shigella and diverged into distinct structural forms, emphasizing their importance in Shigella pathogenesis. Previous study argues that the gsp genes in S. dysenteriae, encoding the T2SS, ought to contribute significantly to pathogenicity as it enables Stx to reach the target host cells from proliferating bacteria. Our CGH result indicates a wide distribution of the gsp genes among strains from all phylogenetic groups which suggests that many strains possessed Stx before their subsequent loss. Perhaps, loss of Stx genes has provided advantages to the bacteria for a better adaptation to the human hosts as causing severer disease offers little benefit to the organisms for long term survival. It is known that the deletion of certain genomic regions present in E. coli (so-called "black holes") enhances the virulence of Shigella [25, 26]. These pathoadaptive deletions could be identified as "absent" on the arrays. Our CGH results demonstrated the existence of those "black holes" in all lineages. The comparative genomic analysis between pathogenic and non-pathogenic E. coli strains reveals that a specific genetic background is required for acquisition and expression of virulence factors . Furthermore, we found that the iron transport system, which is virulence related, is reinforced in Shigella by the development of its own iron transport system, in addition to the retention of most of the iron transport system from E. coli. Shigella species express numerous iron acquisition systems, reflecting the importance of obtaining iron. A previous study which focused on transcriptome polymorphism of Shigella/EIEC also indicated that it was important to acquire iron for Shigella/EIEC . These results indicate that the acquisition of some genes has enhanced the ability of Shigella species to adapt to the complicated host environment during its evolution into an intestinal pathogen. In conclusion, the comparisons performed in this study are necessary for further understanding the implications of genetic background in the evolution of Shigella pathogenicity. These findings provide an invaluable genetic basis for future studies examining bacterial evolution, as well as pathogenicity, and the development of novel strategies for the prevention and treatment of shigellosis. We used 43 Shigella strains to represent the known serotypes. Details are given in Table 1. Shigella strains were routinely grown at 37°C overnight on Luria-Bertani agar plates containing 0.01% congo red. Red colonies were inoculated into Luria-Bertani broth without antibiotics and grown overnight at 37°C with shaking (260 rpm) for isolating genomic DNA. And E. coli K-12 MG1655 strain was routinely grown at 37°C overnight on Luria-Bertani agar plates for isolating genomic DNA. Genomic DNA was extracted by using Wizard® Genomic DNA Purification Kit (Promega). The microarrays used in this study featured 4,188 of the 4,279 ORFs identified in E. coli K-12 strain MG1655 , because 91 ORFs were not on the microarray of the inability to amplify these products. Furthermore, there were 934 ORFs from 4 Shigella strains (Sf301, Sd197, Sb227 and Ss046) which were not present in MG1655 also in the microarray. The ORFs cover the known and putative virulence genes from the Shigella chromosome. ORFs were amplified with specific primer pairs (Invitrogen). To ensure that the elements of our array would detect specifically their corresponding genes and no others, the ORF coordinates fed into the primer program were circumscribed such that they would exclude regions of any ORF that contained significant similarity to any other ORF (70% identity over 70 nucleotides was considered to be significant). Since there were ORFs from different strains, different genomic DNA was used as target according to the dataset. Agarose gel electrophoresis was used to perform quality control on all PCR products. Oligonucleotides were removed from the PCR mix by PCR 96 cleanup plate (Millipore). DNA was resuspended in 12 μl of spotting solution containing 50% dimethyl sulfoxide. PCR products were spotted onto gamma amino propylsilan coated GAPII slides (Corning) with a Cartesian® arrayer (Cartesian). And arrayed slides were blocked prior to hybridization as described previously . For each microarray hybridization reaction, two micrograms of genomic DNA (for test strains) and two microgram reference sample (mixed genomic DNA of MG1655, Sf301, Sd197, Sb227 and Ss046) were fluorescently labelled with Cy5- dCTP or Cy3-dCTP (Amersham) respectively. The separate labelling reactions were pooled after each respective Cy dye incorporation step and then again divided into aliquots to minimize inconsistencies in probe generation. Hybridizations were performed as described previously . Competitive hybridization was done at least three times for one strain. The processed slides were scanned with a GenePix 4100A scanner (Axon). Fluorescent spots and the local background intensities were quantified with GenePix Pro 5.0 software (Axon). The local background value was subtracted from the intensity of each spot. The mean of the signal intensities of the control spots hybridized with labelled reference genomic DNA in each experiment was calculated. Ten different A. thaliana genes and human β-actin gene from SpotReport™ cDNA Array Validation System (Stratagene) were used for the controls. The spots that showed intensity with labelled reference genomic DNA that was lower than the mean value of the control spots were excluded from further analysis. The mean log2 Cy5/Cy3 (sample/reference) ratios of signal intensity were calculated for analysis. In addition, spots that gave invalid results for more than 20% of the strains were removed. The final data set was 5,122 ORFs. The multiple arrays for each strain were averaged across the datasets. CGH data analysis was done by using Microsoft Excel and a microarray genomic analysis program called GACK according to the previous reports . GACK is capable of dynamically generating cut-offs for conserved/divergent gene analysis for each array hybridization and functions independently of any normalization process that would otherwise be strongly influenced by differences between the reference strain and test strains. The hybridization data for the four Sf301, Sd197, Sb227 and Ss046 arrays were filtered by using the same parameters indicated above to avoid copy number effect. The percent similarity for the highest high-scoring profile of each amplicon in the four Shigella genomes was obtained by using WU-BLAST. This percent similarity was compared to the averaged logRAT2N of the hybridization data. Of the 5,122 ORFs that were retrieved, 60 ORFs had hybridization results contrary to what was expected from the percent similarity analysis. A total of 12 of these were false positives, whereas 48 of were false negatives. This list was used as an additional filter for the data. Genome order analysis was performed by organizing the spots for the entire data set in their genome order according to the MG1655 and Sb227, Sd197, Sf301 and Ss046 annotation and viewed with TMEV . Final datasets can be obtained at ShiBASE . In addition, the microarray data has been deposited in the Gene Expression Omnibus (GEO) under accession number GSE5212. Apart from the CGH dataset mentioned above, a similar array CGH data previously published on 19 pathogenic E. coli strains and three Shigella strains was also included in the analysis. The designation of these strains are showed in additional file 5. The E. coli data set obtained from the CGH analysis (0 = absent and 1 = present) was fed into the Phylip software (version 3.6 by Joseph Felsenstein, Department of Genetics, University of Washington, Seattle). Maximum parsimony (MP) trees with equal weighting of characters were drawn by a branch-and-bound search. Tree reliability was assessed using non-parametric bootstrap re-sampling of 100 replicates. Junping Peng, Xiaobing Zhang, Jian Yang contributed equally to this work. The work is supported by the State Key Basic Research Program (Grant No. 2005CB522904), High Technology Project (Grant No. 2004AA223090) from the Ministry of Science and Technology of China. We would like to thank Jianguo Xu (CCDC) and Lei Wang (NKU) for providing strains shown in Table 1. We are also grateful to Charles C. Kim (Stanford) for many helpful discussions about GACK program and to Jun Yu (Sanger) for many suggestions about manuscript. The first three authors contributed equally. JP carried out experiment design, analysed data, and prepared the manuscript. XZ did microarray fabrication and hybridization. JY analysed data. JW cultured strains and did microarray fabrication. EY did PCR amplification and genomic DNA extraction. WB did purification PCR products. CW did part of the data analysis. MS did part of the microarray fabrication and image acquirement. QJ designed the study, analysed data, and reviewed the manuscript. All authors read and approved the final manuscript.